The Original Roo Reiner is our high performance saddle with our signature deep pocket. Our Original Roo Reiner line comes styles with hand stamping and tooling giving that unique and personalized look. This saddle will be custom built to fit you and your horse. The list price is an approximation and will vary depending on your specific saddle. Current rating is 3.00. Total votes 4. The Brumby is a very versatile fitting saddle and will work with most horses in your barn. The pocket in the Brumby is moved forward, creating that straight line from the riders shoulders, to hips, and heels. The Brumby does not come with as many customization as the Roo, which makes this saddle available to you at such a great price.This saddle will be custom built to fit you and your horse. The list price is an approximation and will vary depending on your specific saddle. 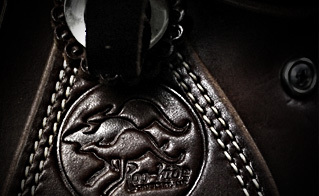 The Original Roo is our high performance saddle with our signature deep pocket. Our Original Roo line comes styles with hand stamping and tooling giving that unique and personalized look. This saddle will be custom built to fit you and your horse. The list price is an approximation and will vary depending on your specific saddle. Current rating is 3.90. Total votes 10. Current rating is 1.80. Total votes 5. Current rating is 2.75. Total votes 4. Current rating is 3.75. Total votes 4. Current rating is 2.78. Total votes 9. The Roohide Barrel Saddle offers a balanced foundation for the rider all while enhancing the horses performance. Our barrel saddles are famous for the close contact feel. We want you to feel your horse, and your horse to feel you! Current rating is 3.64. Total votes 11. Current rating is 3.00. Total votes 14.